Create espresso drinks at the touch of a button. With the De'Longhi EN520 Lattissima Plus, you can create espresso drinks at home with the touch of a button. This automatic espresso machine offers a range of features for fast and easy lattes, cappuccinos, hot milk, and more. With Nespresso coffee capsules and a One Touch Automatic Cappuccino System, this easy-to-use machine creates your drink right into a cup or glass. It even features self-cleaning functions. Lattissima Plus comes with a fully stocked welcome kit that includes Nespresso coffee capsules. The 9.76-pound unit measures a compact 12.59 by 6.69 by 10.23 inches (L x W x H). The all-in-one Lattissima Plus eliminates mess and measuring with the Nespresso patented coffee capsule system. Simply load a capsule into the machine and push the button. The system facilitates the flow of water for delicious, consistent results and an authentic espresso beverage. After brewing is complete, the machine automatically ejects the capsules into a used capsule tank, which can hold up to 10 used capsules. Enjoy a latte or cappuccino in minutes with the Lattissima Plus. Load a capsule into the machine, slide the included milk container into place, and put a cup or glass right under the nozzle. With the push of a button, the machine creates your favorite drink right into your coffee cup. The 12-ounce carafe is easily detachable and can be stored in the refrigerator for later use. With illuminated keys and automatic controls, Lattissima Plus makes it easy to select the drink you want. The controls offer selections for cappuccino, latte macchiato, espresso coffee, long coffee, or hot milk. Program and save your favorite drinks. Make your drinks to your liking. The quantity of milk or coffee for each selection can be adjusted. Lattissima Plus can also be programmed to save your favorite drinks. Ready to use in just 40 seconds. Lattissima Plus features a thermoblock heating system. The machine's self-priming operation reduces heat-up time, so it's ready for use in just 40 seconds. Removable water tank for simple filling. Keeping Lattissima Plus in top shape is easy thanks to the removable 30-ounce water tank, drip tray, and used capsule container. And with the Nespresso coffee capsule system, you won't have to worry about cleaning up coffee grounds. Machine automatically turns off when idle. An auto power-off mode setting helps conserve energy. The machine automatically turns off after nine minutes from the last drink created. The setting can also be changed to 30 minutes or eight hours. Create precise, delicious coffee beverages at home. 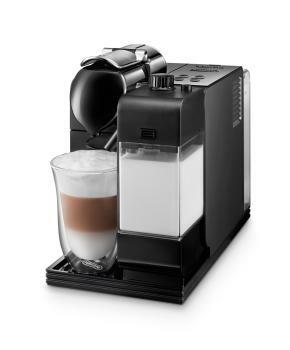 De'Longhi EN520 Lattissima Plus Automatic Espresso Machine and welcome kit with Nespresso Coffee Capsules.